Shame on you owner of the land next to the right-of-way where a tree was planted right in front of a "Share the Road" sign on Hendersonville Road, east of the Biltmore Village area and I-40 interchange in Asheville, NC. I was biking in Asheville recently when I saw what seemed like a Share the Road sign hidden behind a tree. I can only assume the landowner didn't like the Share the Road sign and planted the tree right in front of it. I'm excited to announce that SWFBUD is moving its annual Bicycle Bash Festival into downtown Tampa on NOV 4. The 2012 Bicycle Bash will be held in beautiful Contanchobee Park behind the Forum arena from 10 am to 4 pm. The city of Tampa is a co-sponsor, while the Bash has a new presenting sponsor -- ISM Saddles, which is owned by Steve Toll. SWFBUD will be having a Bicycle Bash Announcement Party at a SWFBUD shop next month, so stay tuned for details. Tampa is changing. More people are riding bicycles -- all types of bikes. Tonight, I pedaled five miles from Seminole Heights to downtown and hooked up with a Critical Mass Ride, which appeared to have drawn about 80 cyclists or so. They were an assorted bunch these bicyclists who gathered at Curtis Hixon Park. There were the helmet-less guys on fixies and young women on mountain bikes and older folks on hybrids and even a young turk on a high bike shown in photos below. But the fact is that there is a real NEW Tampa -- one where people want to enjoy riding their bicycles. You did it. Thanks to your work we won our vote to delaying demolishing the bridge. This isn’t just about the bridge; we’ve shown everyone in the area that when you come together and put forth a vision -- you can do anything. Even build a bridge. For weeks we’ve been telling you about the vote at Hillsborough County Commissioners and we’ve reverse the course toward demolition that we have been on for four years. Commissioners Beckner, Sharpe and Crist took the lead and the vote ended up being unanimous. Your calls, your emails, and your work won this vote today. But our victory today is just the beginning. Our next task is to complete a full inspection and engineering study of the Friendship Trail Bridge. We are going to be evaluating several engineering options and funding methods. How we won today is how we will get over the next hurdle -- with your help. We are now accepting donations thanks to the help of our partner Creative Tampa Bay. Please take a minute and make a donation right now. Many people counted you out over the last 90 days. They called us “dreamers” and claimed the decision was already made. But you proved them wrong. We can’t stop now. All these donations will add up together to help us reach our initial goal of $100,000 to start our study. Also, we are having a meeting on Monday at 6PM for everyone to get involved. It will be in Tampa at the AIA headquarters. We will set up committees to work on Public Relations, Community Outreach, Fundraising, Events, and more. We will to need your help no matter what you can afford to give today. Thank you again. You saved the bridge today -- tomorrow you will help us transform it into a linear park over the bay. We can’t wait to join you for a walk, run or ride on the bridge again someday. Today SWFBUD celebrated a huge win when I joined a chorus of voices at a Hillsborough County Commission meeting where we convinced county commissioners to NOT demolish the Friendship TrailBridge -- the beloved bicycle/ped bridge that has been closed since 2008. I want to thank County Commissioners Kevin Beckner, Mark Sharpe and Victor Crist who said demolishing the 2.6-mile bridge that connects Tampa and St. Petersburg was putting the "cart before the horse" when the county administrator proposed a new budget that included a possible bond referendum for $80 million in parks and recreational facilities, including a new Friendship TrailBridge. After the 7-0 vote to NOT demolish the FTB, Beckner joined FTB group organizer Kevin Thurman for a Bay News 9 interview outside the county center. Below, Jim Shirk spoke out for the TrailBridge. And below that photo Ken Cowart talks with Mike Salinero of the Tribune and Mitch Perry of Creative Loafing about our success at saving the FTB. SWFBUD has lobbied hard to get Hillsborough County government to save the Friendship TrailBridge and convert the closed trail bridge into a linear park. SWFBUD has worked hard in that regard with a group of professionals to back a proposed plan to save the old Gandy Bridge. (Merrill) also presents the option of asking voters to approve a slight property tax increase that would be dedicated to parks and recreational centers. It would function similarly to the county's Environmental Lands Acquisition and Protection Program. The county would take on debt to pay for a number of building projects, using proceeds from the tax to pay it over 10 years. Included on the list of projects is $27.5 million to preserve the Friendship Trail Bridge, a former span of the Gandy Bridge, and converting it into an over-the-water linear park. Merrill said he has heard enough positive feedback from commissioners to bring forward the new tax proposal. But it was unclear late Friday if the enthusiasm will wane once the proposal gets publicized. The 0.15-mill tax would cost the owner of a house valued at $165,000 about $25 a year. "It is something that gives the voters an option to give either a thumbs-up or thumbs-down," Merrill said. He said the county has all summer to get public feedback, not having to approve a referendum for the November ballot until September. TIGER funds will be used to support bicycle and pedestrian transportation connections downtown. This project will complete the remaining sections of the 2.6 mile Tampa Riverwalk and construct the 1.7-mile Selmon Greenway. This project completes 12 years of planning by providing a 2.4 mile multimodal transportation loop in downtown Tampa. This project is supported by both public and private entities, including a non-profit created specifically for capital fundraising. You may be wondering "Why all the action alerts?" and "Will this federal transportation bill EVER be done?" Well, rest assured: You are not alone. We would love for Congress to pass a bill and do what 83% of your fellow American's want -- maintain or increase the percentage of transportation funds going to bicycling and walking. Instead we are having to constantly fight to prevent that funding being stripped altogether. You can be equally sure, however, that your e-mails and calls really do make a difference and there wouldn't be any funding to preserve if you weren't willing to speak up. So, thank you for taking action again today - and for hanging in there with us until the job is done! SAN FRANCISCO—City prosecutors said they would file felony vehicular-manslaughter charges against a bicyclist who allegedly hit and killed a pedestrian, in a case that has become a flash point for debate over bicyclists' rights in the city. The manslaughter charges—unusually stiff for a bicycle accident—stem from a March 29 incident, when 36-year-old bicyclist Chris Bucchere allegedly ran a red traffic light and plowed into 71-year-old Sutchi Hui in a crosswalk. Mr. Hui died April 2 of injuries related to the collision. Kudos to the staff of the new PBS TV show called Pedal America led by host and my good friend Ira David, who visited Tampa and St. Petersburg back in December for an episode on the local bicycle scene in Tampa Bay. Ira David did episodes on places like Chicago, Savannah, the Napa Valley and Austin, and I appreciated Ira David singling out Tampa as a "work in progress" bike town. The Pedal America episode came along for a Seminole Heights Bicycle Club bike ride to Hyde Park Village and back in Tampa and then documented the SHBC's bicycle-theme art show after the bike ride. I enjoyed working with Ira David's crew led by producer Stephanie Rabiola and appreciate him allowing my to discuss SWFBUD's BAM Network plan which calls for three regional bike trails in Hillsborough County to be connected into a highway system for bicyclists in Hillsborough: the Tampa By-pass Canal Trail, the South Coast Greenway and the Selmon Greenway. Please watch the show if you have Bright House or Verizon. I believe the Pedal America episode on Tampa will be shown Monday at 9AM on Bright House 605 and on a Verizon channel. It was great to bike from Tampa to St. Petersburg this morning to meet Ken Cowart and Julia Gorzka and tell the St. Petersburg Bicycle Club about the plan to rehab the closed Friendship TrailBridge into a world-class linear park over the Bay. We met several dozen St. Pete cyclists at the North Shore Park after the bike club's rides at 10 am and SWFBUD was impressed by the support voiced by the St Pete cyclists for the FTB plan. Here is Ken talking to a club member this morning. It was great to see John Sinibaldi of St. Pete and also Boston Bill at the gathering, which included several dozen St. Pete cyclists. We need everyone to attend a Hillsborough County Commission meeting on June 27 to tell the commissioners to NOT demolish the FTB and instead accept the plan's first goal to conduct a feasibility study during an eight-month period. After meeting the St. Pete Bike Club, SWFBUD biked back to Tampa on the shoulder of the current Gandy Bridge (photo above) and saw these other three road cyclists. The shoulder might be OK for road cyclists but the vast majority of people who ride bicycles are casual bike users who would never bike this shoulder. That's why we need a rehabbed FTB to replace the current bike/ped bridge. During recent negotiations on a new transportation bill, the House of Representatives proposed drastic cuts that would hurt bicycling. Their plan would allow states to take federal transportation funds that make roads safer for bicycling and divert them to other uses, without any input from communities like yours. This means local communities could miss out on the important benefits of bicycling, like reduced road congestion, increased safety, and lower health care costs. It could hurt your bike riding experience, too. This House initiative threatens to scrap 20 years of steady Congressional support for modest, cost-effective investments that make bicycling a safe transportation choice for Americans. It is a bad idea that must be stopped. Please contact your two U.S. Senators and one U.S. Representative today. (You can find your representatives, review basic suggested text for your email, and send your note directly from this link above.) Urge them to back the Senate’s sensible proposal (learn more here) to assure the participation of local government leaders in key transportation decisions about bicycling. More blood on the roads. This time a cyclist was killed in my hometown county of Rockland County, about 30 miles north of New York on Route 9W -- a popular north-south road used by many cyclists. An hour east of the Seattle area are the mighty Cascades. Below is an old rowboat converted into a planter at Magnuson Park on Seattle's famed Lake Washington. And below that is a pedicab complete with canine mascot dressed in Univ. of Washington colors. "I went to court this morning for the start of the trial for Shawn Lee Burton, the motorist who was arrested on Oct. 19, 2010 for the hit-and-run death of Kayoko Ishizuka on Sept. 25, 2010. From past experience, especially for jury duty last Monday, I wasn't expecting it to start at 8 a.m. as "scheduled," so I didn't arrive till a little after 9. I was still much too early because it wasn't till 10:45 that his case came up. Both the assistant state attorney, Barbara Coleman, and Burton's attorney, Kim Seace, asked Judge Stephens for a continuance. The judge granted it, and the start of the trial was rescheduled for Wednesday, August 1st. That's 1 year, 10 months, and 7 days after Kay's death. You all may be glad to hear that Burton is still in custody. In the courtroom, he was wearing the standard orange prisoner outfit with wrist manacles attached to a chain around his waist. After his trial was rescheduled, I was out in the hallway, telling a 10 News photojournalist who was there for the trial about the new date, when Burton's attorney came out of the courtroom. I asked her, "Has your client, Shawn Burton, been in custody since he was first arrested?" She said that he has. I guess he couldn't raise enough bond money. His bond was originally set at $100,000. Last August the defense filed a motion to have it reduced, but Judge Stephens denied the motion. In case any of you are wondering how much prison time Burton might get if he's eventually found guilty of the charge "leaving the scene of a crash with death," last Monday I nearly wound up on the jury for the trial of William Charles White Jr. (I was one of 60 potential jurors, and it took all day for the final jury to be selected.) White was arrested in July of 2010 for intentionally running down a pedestrian following an altercation. The formal charges against him were "murder in the first degree (premeditated)," "leaving the scene of a crash with death" (same charge as Burton), and "fleeing to elude highspeed." The jury found White guilty on all 3 counts last Friday, and he was sentenced to life in prison without parole for the murder charge, 15 years (maximum) in prison for the fleeing to elude charge, and 30 years (maximum) in prison for the charge of leaving the scene of a crash with death." I was joined by more than a half-dozen speakers such as Ben Ritter of the Florida Gulf Coast Paralyzed Veterans of America (below), Ken Cowart below who spoke and then listened to County Commissioner Victor Crist praise the FTB report (below Ben Ritter photo), Seminole Heights resident Susan Long who explained that her kids left Tampa because the region needs amenities such as the Friendship TrailBridge and Seminole Heights bicyclist Margaret Shepherd, wlo listened below to Ken Cowart address the commission. W e also had other speakers including plan co-author Kevin Thurmon and bridge advocate Neil Constentino, while Hillsborough-Tampa Bicycle Pedestrian Chairman Jim Shirk and Jordan Miller of Velo Champ bicycle shop in Seminole Heights also attended. I submitted a BPAC letter signed by chairman Shirk backing the FTB project. To our friends, customers, neighbors and the bay area cycling community. Our shop was broken into last night (Sunday 06/03/2012) at approximately 11:00pm. The front door was kicked in, and a Cinelli Experience road bike was stolen. 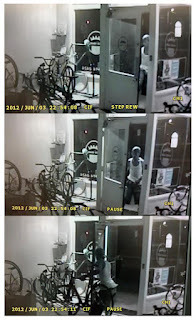 Our great neighbors identified the thief heading South on Central leaving the shop. We have detailed camera footage and some positive forensic evidence to help in catching this person. If there is anyone with information regarding the incident, we look forward to hearing from you. In addition, if you see the bike, please notify law enforcement and/or call us ( 813-374-2424 ). We are thankful that we have such careful neighbors, and hope with fingerprints and some video detail we catch this person. Quick casual meet up on Tuesday June 5 at 6PM to discuss where we are in the plan and update everyone on the progress thus far on Transforming the Friendship TrailBridge. Hillborough County Commission will be discussing our plan on Wed June 6. This meeting is to organize our message and give key insights to the plan. Tuesday 6 PM meeting will be at the AIA office at 200 N Tampa St, Tampa, FL. It's been nine years since this retired Marine sergeant returned from combat in Iraq, and it was time to start a new assignment -- working as a psychology intern at the Madigan Army Medical Center at the Joint Base Lewis-McChord in Tacoma. Ex-Marine combat vet Rich Blake, who will be commissioned as an Army captain when he begins his internship on June 4, did an externship at the Veterans Administration Hospital in Baltimore to help get ready for his new stint. Blake worked with Dr. Deborah Kalra at that VA facility. Dr. Kalra just happens to be the sister of Bicycle Stories and tipped off this blog about Blake's incredible two-wheeled, cross-country journey. Bicycle Stories talked with Blake today. When Blake -- the former infrantryman turned doctoral student -- was ready to leave Baltimore for Tacoma, he did not start the ignition of a car or board a jet. Instead, Blake hopped on the bicycle saddle of a Trek 29er mountain bike and pedaled some 3,200 miles in 32 days, including more than 200 miles the final day when he biked through the night and reached Tacoma at 7 a.m. on June 1. Dubbed "Operation Return to Duty," the solo, self-contained bike voyage raised $25,000 for two charities -- The 6th Branch, which is a community service organization he helped found, and also the Semper Fidelis Health and Wellness, a pro-bono health services organization. Blake wanted to get into psychology because he served on the front lines and could relate to the psychological experiences and combat stress facing vets. He earned his undergraduate psychology degree at Florida Atlantic University and is pursuing his doctoral in clinical psychology at Loyola University in Maryland. Pedaling the bicycle to start his military internship in Tacoma was consistent with Blake's desire to serve. Blake used his Trek 29er to bike commute in Baltimore. He was given a Kona cyclecross bike for the cross-country trip, but stuck with the 29er mountain bike because it felt more comfortable. The trek across America was challenging. On one day, Blake confronted 45 mph winds in Minnesota and was able to pedal a mere 30 miles from 6 am to 12 noon into the teeth of the headwinds. So, he took a break from the road and resumed his bike ride later at 2 a.m. when the winds died down. "It just wasn't efficient biking into the wind during the day," Blake said of that one particular morning in Minnesota. "So, I just waited it out and got up early (at 2 a.m.) to bike." Later in Montana, Blake had to take two days off to let saddle sores heal enough for him to continue. And there was also a rest day in Illinois and nine broken spokes along the way. There was a good day, too, such as the day in North Dakota when tailwinds pushed Blake to pedal 180 miles on that day. Despite the physical challenge, the ride was inspiring and gave Blake new perspectives on life across the country. "The perspective is so much different from a bicycle. It broke a lot of stereotypes. I can tell you that Iowa is not flat and Washington state is not just apple trees," Blake said. Bicycle Stories says, "Congratulations Army Capt. Blake," and good luck on your next assignment. You can-do attitude will help many veterans. "I know it appears that we've been silent for the last few days, but rest assured there has been plenty of great "behind the scenes" action taking place. First and most important, Hillsborough County BOCC has once again moved the vote. It is now on the June 27th agenda. BUT WAIT! We still plan on having a showing of support on June 6th. It is very likely that our plan will be discussed on the 6th, so we still need everyone to attend in support. There will be a short volunteer meeting on June 5th in the evening to give everyone an update on our plan. Look for a FB event posted shortly with the information. Thanks for your support and please tell your friends to sign up at our website www.friendshiptrailbridge.com"
First, there’s shock, which turns to sadness. Now, there’s outrage and the need to act. The facts are simple: On May7, 2011, while driving across the Sanibel Causeway, Theresa Shirley veered across oncoming traffic and struck Tracey Kleinpell, who was riding her bicycle along the shoulder. Kleinpell died at the scene. Shirley walked away – and apparently will now walk away again without taking any responsibility for her actions. So we ask: What happened to the investigation into this homicide? Why wasn't all the evidence gathered and appropriately analyzed? Why did it take the Florida Highway Patrol (FHP) more than a year to bring this investigation to a close? · IIs FHP capable of properly investigating any fatality involving a bicyclist or a pedestrian? The local pattern indicates cyclists and pedestrians are second-class citizens when it comes to roadway safety. How was so little evidence collected by FHP that the State Attorney’s Office (SAO) felt it was left with few legal options to seek punishment for Shirley? Was “failure to drive within a single lane” the best legal option left? Really? Even if the FHP botched the investigation, prosecutorial discretion allows the SAO to aggressively pursue criminal acts if the situation warrants – and we think it does. Look at the cocktail of prescription drugs (muscle relaxants, anti-anxiety meds and narcotic pain pills) found in Shirley’s bloodstream, any one of which carries a clear warning to “use caution when operating a car." Didn’t authorities deem that to be “reckless” behavior or “driving under the influence”? Finally, where’s the justice? How can one person take the life of another, in a case where the fault is crystal clear, and the killer walks away with minimal consequences? First, we call on Gov. Scott to launch an investigation into the FHP’s handling of this case and a broader look into FHP’s investigative practices into bicycle/pedestrian fatalities. The troubling pattern of disregard for the rights of the most vulnerable road users warrants a closer look. Second, we call on the FHP to recuse itself from any investigation into bicycle and pedestrian traffic homicides until this inquiry is complete and any recommended changes can be implemented, allowing local law enforcement agencies to handle these cases in the interim. Third, we recommend Gov. Scott and the Legislature undertake a comprehensive study into the safety of the state’s transportation system for vulnerable road users (pedestrians, cyclists, and motorcyclists). Fourth, the SAO needs to charge Shirley commensurate with the seriousness of the crime, not let her off for killing another person. Fifth, if there’s a legal gap here that allowed Shirley to fall through the cracks, we need to hear about it from the SAO and FHP. While we think there are laws in place that could have been applied here, if a new law is needed to ensure justice, tell us. Finally, we encourage bicyclists and pedestrians to keep the faith. Cycling and walking are still safe pursuits and a vast majority of motorists do drive responsibly and are willing to share the road. What can you do? Tell Gov. Scott to investigate FHP’s handling of this case and support a safety study of Florida's roads. Tell FHP (fhp@flhsmv.gov) to recuse itself from bicycle and pedestrian traffic homicide investigations. Tell the SAO to bring criminal charges in this case (stateattorney@sao.cjis20.org ). We can’t stress enough the importance of fair and thorough enforcement of traffic laws to keep our roadways safe. When laws are enforced, they are obeyed; conversely, when enforcement is lax or inconsistent, more road users cut corners, engage in dangerous behavior and put themselves and fellow users at risk. Dan Moser is on the steering committee for BikeWalkLee, a community coalition raising public awareness and advocating for complete streets in Lee County. A more detailedBikeWalkLee statement on this issue is available online at www.bikewalklee.com.